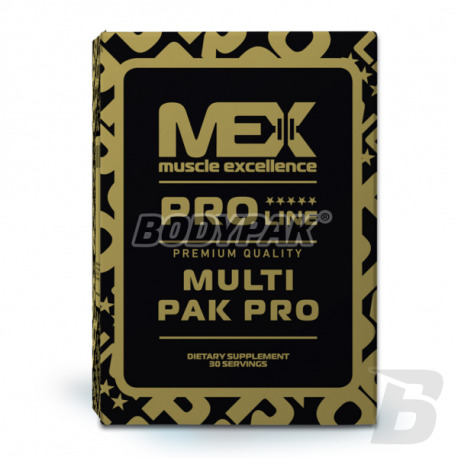 Vitamins & MineralsMEX Multi Pak Pro [Pro Line] - 30 sasz. 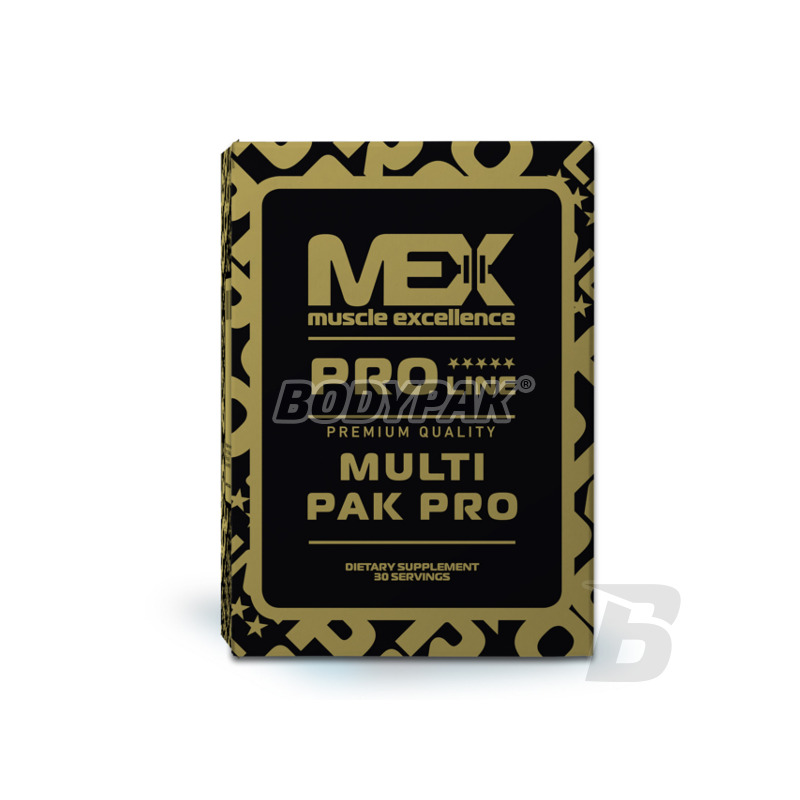 MEX Multi Pak Pro [Pro Line] - 30 sasz. The most modern supplement brand Muscle Excellence line with the Flex Wheeler, who is already probably the most complete set of vitamins and mineral supplements on the market. Only the highest quality! The product belongs to the line of supplements: Flex Wheeler PRO LINE! There is little preparations as complex as this one. A huge amount of substances affecting the health improvement in one place! The product was designed for people who are physically active, where the demand is correspondingly higher than those with a small amount of traffic. Flex Wheeler MULTI PAK PRO is the most advanced supplement brand Muscle Excellence line with the Flex Wheeler, who is already probably the most complete set of vitamins and mineral supplements on the market. The very fact that Flex Wheeler MULTI PAK PRO in one serving provides 28 active ingredients shows that it is determined to number one on the supplement market when it comes to health products. It provides the highest quality vitamins and minerals based largely on citrate, so you are guaranteed that your body is equipped with a range of micronutrients superior absorbability. About Flex Wheeler MULTI PAK PRO could speak much, but certainly there is no need, as the product itself speaks its composition. Today, it is the richest part of the market that supplied additionally in antioxidants has a very strong antioxidant properties and offers to rid the body of harmful free radicals. Each separate component is specific in its own way, as both accelerates regeneration and improves the immune system. However, all together they form the absolute number one, as appropriately selected, synergistically acting blend will reduce the level of bad cholesterol, adjust the heart, will help avoid infection, as well as much easier to rebuild damaged muscle fibers. In addition, MULTI PAK PRO significantly improves the condition of hair, skin and nails, as well as reduces stomach discomfort! This revolutionary supplement is designed for both intensive training athletes at risk of injury and congestion, as well as people who have nothing to do with sport, and want to significantly improve their health. FLEX WHEELER MULTI PAK PRO - ONLY SO COMPLEX PREPARATION! Ingredients: Hydrolysed beef protein isolate, calcium (calcium glycerophosphate), omega-3 fatty acids including EPA and DHA, magnesium (magnesium citrate), vitamin C (1- Glucose polymers, gelatin, vitamin E (a mixture of tocotrienol and tocopherol), l-leucine (BCAA), l-lysine (EAA), l-ascorbic acid, calcium phosphate carriers, oleic acid, l-valine and L-serine, l-isoleucine, l-alanine, alpha-lipoic acid (ALA), vitamin B5 (calcium d-pantothenate), gamma-linolenic acid (GLA), glycerol - surface active substance, l-threonine Vitamin B2 (riboflavin), vitamin B3 (nicotinic acid amide, inositol hexanicotinate), vitamin B6 (pyridoxine hydrochloride), mixture of ingredients, papaya powder 1-phenylalanine (EAA), 1-histidine, magnesium salts of fatty acids (anti-fracture substance Zinc picinate, 1-tryptophan (EAA), silicon dioxide - anti-caking agent, beta carotene (as provitamin A), coenzyme Q10, manganese Lutein, lycopene, copper (as copper amino acid chelate), folic acid (pterolomonoglutamic acid), biotin (D-biotin), vitamin B12 (methylcobalamin), selenium (l-selenomethionine), chrome Iodine (from seaweed), molybdenum (as amino acid molybdenum), vitamin D (cholecalciferol), Lactobacillus acidophilus, Bifidobacterium bifidum. Odczuwalnie lepsze samopoczucie. 1 saszetka zawiera 8 tabletek, ktore mozna podzielic na trzy porcje w ciagu dnia i poprawic wchanialnosc poszczegolnych skladnikow/witamin. Naprawdę rewelacyjny produkt warty swojej ceny. Zażywam go od 2-tygodni czuję o wiele więcej wigoru i ogólnie siły. Brałem witaminy Treca, Bodymax, Animal Pak i żadne z wyżej wymienionych nie podziałały na mnie tak jak MEX. Bardzo kompleksowy skład produktu zapewnił mi lepszą regenerację w ciągu dnia oraz lepsze samopoczucie. Nie wierzyłem w jego działanie, ale za namową znajomego postanowiłem spróbować i nie żałuje. Teraz ja mogę polecić dalej! Olimp Gold-Vit B Forte - 60 tabl. Is recommended as a dietary supplement that facilitates cover daily intake of vitamin B. Indispensable at the moment of increased stress and in addition to poor diet in witeminę B! Comprehensive vitamin and mineral preparation created with respect to the needs of the female body! It adds vitality, affects the health of hair and skin. In addition, it strengthens the body, replenishes all deficiencies and helps to maintain slim figure. Highest quality at a good price!